It seems nowadays that people are willing to do just about anything to go viral, even if it includes scaring your girlfriend to death with a marriage proposal. One Mobile, Ala., man thought it would be a good idea to involve the local police department to help him propose to his girlfriend. But for some on social media, it was the furthest thing from a good idea and more like an indecent proposal. Daiwon McPherson figured the second time would be a charm when it came to proposing to his girlfriend, Shawna Blackmon, and he wanted to make a grand gesture. Not only did he get his bike crew involved, but he also enlisted the help of the police department. In a video that has since gone viral, Blackmon shows up to a gas station after receiving a phone call from a friend saying that McPherson was running away from cops. When Blackmon shows up, McPherson is down on his knees and two white cops are pointing their guns at him. 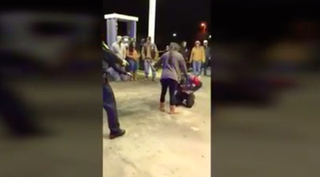 As one commenter wrote about the video, "Faux police arrest proposal? Sorry, that's not romantic or cute." I'm trying to wrap my head around the whole reasoning of involving the police with guns drawn. What if his girlfriend had come on the scene and gone ballistic? What would have happened to his little proposal stunt then? "I know my girl, I know exactly how she act, that's why I did it this way," McPherson said. "We both ride and bikers always have a problem with the police. Clearly we're both black, and you have the whole Black Lives Matter thing going on." McPherson continued by saying that a lot of good cops are his tattoo clients and that he didn't plan on the video going viral. He wanted to get a message across? But exactly what message was that? Anything can go viral, even when you say you weren't trying to.